Adding a menu to your WordPress website is an important part of creating it. We want to make this process for you as easy as possible. While using the Visual Composer Website Builder, you can choose between multiple menu elements, to elevate the appearance of your site and make it easy for the visitor to navigate through it. Simple, open Visual Composer Hub and locate menu content elements to download. Add menu element and in menu source select the menu you created in step 1. Visual Composer Website Builder offers your various types of menu, like Sandwich or regular text menu. We are also regularly updating Visual Composer Hub with new content elements. The awesome part of Visual Composer is that you can add menu anywhere on the site. 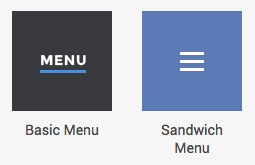 For example, you want to add a sandwich style menu on the top right corner of your site – simply download menu element and place it in the column.